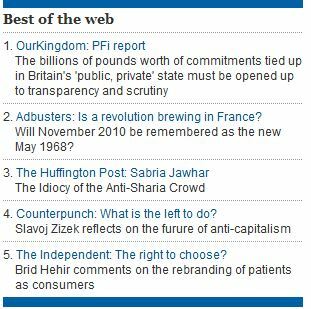 CiF’s “Best of the Web” included an essay published by Slavoj Zizek on the radical anti-Zionist publication, Counterpunch. Even CiF contributor Tony Greenstein has characterized Atzmon as anti-Semitic. The line separating left-wing and right-wing anti-Semitism has indeed blurred over the years – with left-wing writers engaging in tropes consistent with classic paleoconservative anti-Semitism (dual loyalty, and Jewish power). Though CiF Watch typically describes the Guardian’s brand as left-wing (they, after all, aspire to be the “world’s leading liberal voice”), I think its a fair to ask whether their “left-wing” politics are really just “right-wing” politics with a left-wing veneer. The Guardian’s decision to link to, and thus legitimize, Counterpunch, raises serious questions about what exactly the term “liberal” means in the political context of the UK. At the very least, the characterization of left-wing anti-Semitism as the “Socialism of Fools” seems more apt all the time. b) It is a sociologial analysis. p.s. I’m no fan of Counterpunch – but does it really support the “idea that Jews were behind the 9-11 attacks”? The Guardian’s classic liberal fascism showing – going back all the way to the French Revolution. The Guardian’s writers are just dying for another Robespierre figure to release all their pent-up love for Zizek’s big (M)Other. If I remember correctly there are two Alison Weirs. One is a disgusting antisemite and the other is a legitimate historian. Unfortunate. You post those claims as if they were the truth. Those are pretty serious accusations. Adam, don’t forget the “socialist” part of this: Nationalsozialistische Deutsche Arbeiterpartei. Good god. The tea party invasion has begun. pretzelberg, where’s the “Tea Party” in the following? Here’s a fine example of Zizek playing with words. Note the absence of any concept of “the enemy”. And if Jews have any humanity it is only in their care for other Jews. What a bad man he was. And that pact is of what relevance here? Communists-Nazis. Isn’t it obvious? Where was the “Tea Party” then? You introduced it. Now justify it. Good God. They actually want money for that crap?